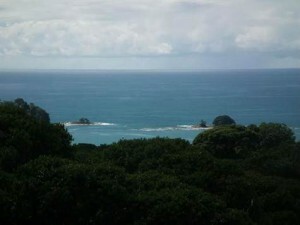 This is a very beautiful property located in Escaleras, one of the best communities in Southern Costa Rica. It is 5 min from the paved highway on an escellent gravel road and also only 5 min to the beach. The property has a very large open buildable area that gently slopes down towards the ocean allowing for creative construction of multiple villas. It is perfect for a retreat center or a hotel or just for an estate. The property has 2 creeks, one that you pass on the way in and the other is an easy walk down into the jungle. The ocean views are great!!! The power and water are all in place.